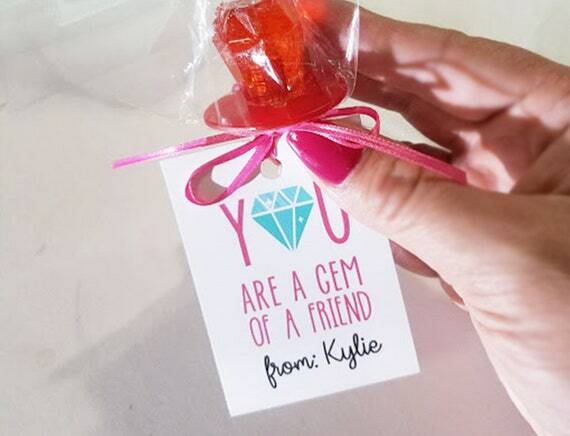 How cute is this "Gem of a Friend Valentine tag!?! The best part is that you can print them at home and as many as you need. • Wait up to 20 minutes to receive access to your digital Valentines. Only Name is editable- Add, remove and edit text color, size & position of Name. ***Please Note: This item is a pre-designed DIGITAL FILE for you to edit and send electronically or print and distribute for your party. You will not receive physical invitations in the mail. After purchasing the listing, you will receive a link in the email associated with your Etsy account to access your files (look for "Templett Orders"). Check your spam/junk folders if you do not see it in your inbox. To edit, simply replace the sample text with your own. Change text size, color, and font to your liking! Edits must be made on a laptop or desktop computer. You will not be able edit these on a cell phone or tablet. Print on your home color printer OR send to the printer of your choice. •Due to the nature of this item, refunds will not be given after purchase. All sales are final. Grab everyone’s attention and make the most of your party with high-quality digital invitations today!